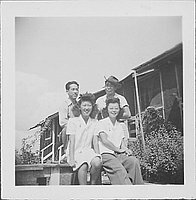 Portrait of four adults outdoors, two women seated in front, two men standing in back with barracks in background at Rohwer concentration camp, Rohwer, Arkansas, 1942-1945. The women sit on a porch or some slightly elevated structure. Woman sitting at R wears glasses and pants. Behind her, man at R wears a cowboy hat, tilted to the side.